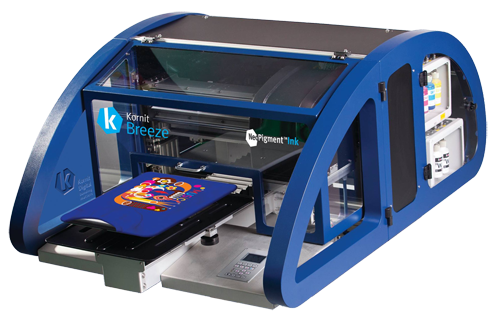 Growing digital t-shirt and textile print businesses enjoy tremendous cost and quality performance advantages with the Breeze. Immediate direct printing, from either computer or web, delivers amazing retail and ecommerce production. Even printing on dark fabrics is easier with the Kornit printing process. All with the best possible return on investment business model. Consistent results come with the use of the integrated automatic pretreatment, degassing and its own maintenance system. Further, not only does it offer great versatility for fabric variety and base colour, it offers even greater versatility with it's 6 height-adjustable industrial Spectra print heads for printing over zippers, buttons and raised objects. The print area is up to 14x18 in (ie.35x45cm). It's NeoPigmentTM 5 colour process with integrated pretreatment delivers unsurpassed quality. Smooth NeoPigment ink flow assures reliability and consistency. The biodegradable NeoPigment ink delivers energy saving and eco friendly printing. You will meet strict industry standards of infant wear, etc. (Oeko-Tex, GOTS, AATCC). It has 6 height-adjustable industrial Spectra Piezo PolarisTM print heads, with 256 nozzles per head. Throughput (shirts/hr) Light Garments:up to 40, Dark Garments:up to 25. Power Requirements are 230/110 VAC, 50/60 Hz, 1 phase. Operating Systems; Windows XP and Windows 7. Printing resolution is up to 600dpi. Operating conditions include; Temperatures: 18°C-30°C / 64.4°F-86°F, Humidity: 45%-95% relative humidity.